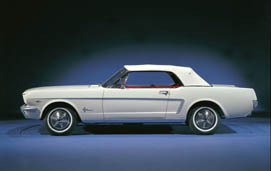 DEARBORN, Mich., April 16, 2009 – Ever since the debut of the original Ford Mustang 45 years ago, there has been an ongoing debate about what to call the pony cars built between April and August of 1964. Are they “1964½” Mustangs or 1965 models? Technically, all of the original Ford Mustangs are 1965 models because all carry a 1965 model year Vehicle Identification Number (VIN). But the majority of Mustang enthusiasts throughout the world are purists at heart, and they know very well that the vehicles produced from April to August of 1964 were different enough from those manufactured during the remainder of the model year to warrant giving them another name. The biggest change was in the electrical system. The so-called 1964½ Mustangs used generators while those made during the standard 12-month 1965 model year used alternators. Also, the V-8 option was different. The 1964½ models used the 260-cubic inch V-8 engine, while the 1965 models employed a 289-cubic inch V-8 engine. Those lucky enough to own a Mustang built between April and August of 1964 view their pony cars as a totally different breed of the steed.